The BBC Computer was developed by Acorn Computers to a BBC specification, and is a remarkable machine, both in performance and in value for money. It is interesting to note that the Sinclair Spectrum is being promoted as a "direct rival to the BBC Computer, but at half the price." Our view at Control Universal is that the Spectrum certainly does represent very high performance for the money, and we would be pleased to sell it, should we be invited to do so. However, the BBC Computer is clearly superior, and well worth the higher price. The following short comparison indicates this. There are many more points of difference, and our comparison is based only on literature checks, but we summarise both computers as excellent value for money, and the Sinclair as a first class introductory machine for the hobbyist, and the BBC Computer as a first class serious computer capable of almost limitless expansion. 73 key full OWERTY layout, including 10 user definable function keys, 4 cursor control keys, two key rollover and auto repeat. Mixed high resolution graphics and upper and lower case text. UHF, composite video and separate RGB and Sync outputs. 300 baud and 1200 baud interface (with motor control) for standard cassette recorders. Three-voice music synthesis with full envelope control feeding internal loudspeaker. "Tube" connector for second processor option. 16 bit processor with 128K RAM. A fast, powerful self-contained computer system generating high resolution colour graphics and capable of synthesising 3-part music. The computer is contained in a rigid injection moulded thermoplastic case. The following are contained within the computer thus ensuring the minimum of connecting wires. 73 key full travel QWERTY keyboard with 10 user definable function keys. The keyboard has two key rollover and auto repeat. Internal 240/11 5V power supply is fully encased and made to BS Class 1. The internal loudspeaker is driven from a 3-voice music synthesis circuit with full ADSR envelope control. A fully modulated PAL colour television signal, for connection to a normal domestic television aerial socket, is available through a phono connector. A BNC connector supplies a composite video output to drive a black and white or PAL colour monitor. A standard audio cassette recorder can be used to record computer programs at 300 or 1200 baud using the CUTS standard tones. The cassette recorder is under full automatic motor control and is connected to the computer via a 7 pin DIN connector. I An interrupt driven elapsed time clock enables real time control and timing of user responses. The unit uses a 2 MHz 6502 and includes 16K of Random Access Memory. A 16K Read Only Memory (ROM) integrated circuit contains an extensive and powerful Machine Operating System designed to interface easily to high level languages. A further 16K "Language ROM" contains an extremely powerful and fast BASIC interpreter. The interpreter includes a 6502 assembler which enables BASIC statements to be freely mixed with 6502 assembly language. Up to four 16K Language ROMs may be plugged into the machine at any time. These four ROMs are "paged" and may include Pascal, Word Processing, computer aided design software, Disk and Econet routines or Teletext acquisition software. The standard television output is 625 line 50 Hz, interlaced, fully encoded PAL, modulated on UHF channel 36. Other standards are available. The full-colour Teletext display of 40 characters by 25 lines has full character rounding with double height, flashing, coloured background and text - all to the Teletext standard. The non Teletext display modes provide user definable characters in addition to the standard upper and lower case alphanumeric font. In these modes, graphics may be freely mixed with text. Text characters can be positioned not only on, for example, a 40x32 grid, but at any intermediate position. Separate or overlapping text and graphic windows can be easily user-defined over any area of the display. Each of these windows may be filled and scrolled separately. All graphics access is "transparent" resulting in a fast snow-free display. Extensive support is provided in the Machine Operating System for the graphics facilities, and this is fully reflected in the BASIC interpreter. These facilities include the ability to rapidly draw lines and to fill large areas of colour. In addition, very rapid changes of areas of colour can be effected. 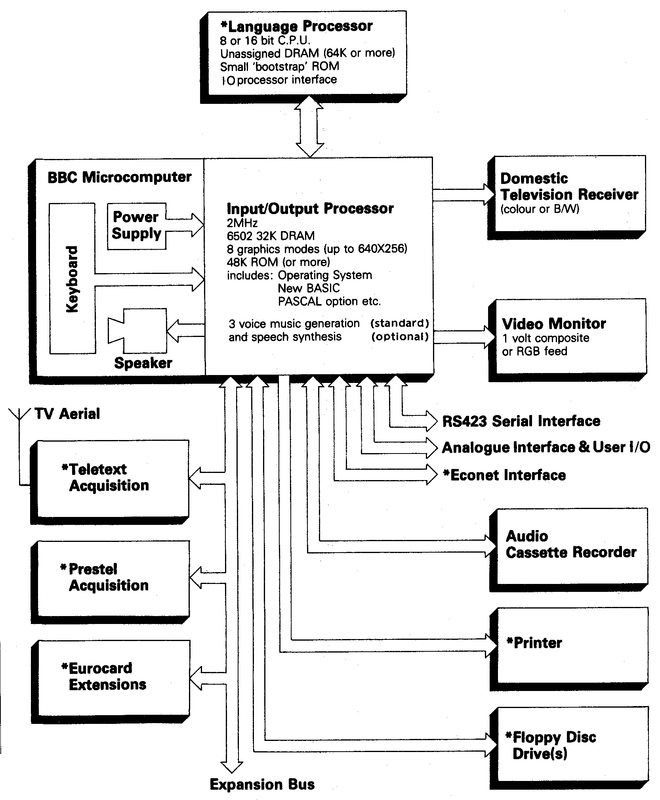 The Model A BBC Microcomputer System can be expanded at any time to the Model B System. In addition, or as an alternative, other facilities such as the Econet, may be fitted within the computer systems. The installed RAM is divided between the high resolution graphics display, the user's program and Machine Operating System variables. The Machine Operating System requires about 3¼K of RAM in the Model A. If higher resolutions are required with large programmes then the second processor option may be fitted. Serial interface to RS423 standard. The new standard has been designed to be inter-operable with RS232C equipment but offers a considerably enhanced specification for example in maximum length of cable and maximum data transfer rates. Baud rates are software selectable between 75 baud and 9600 baud. The interface provides not only two-way data transfer, but also two way hand-shaking using RTS and CTS lines. Connection to the machine is made via a 5 way "diamond" DIN connector and various interconnecting plugs are available for the various standard 25 way D type circuits. An 8 bit "Centronics type" parallel printer port is provided with "Strobe" and "Acknowledge" lines. An 8 bit input/output port is also provided. Four 12-bit analogue input channels are provided. Each channel has an input voltage range of 0-2.5V and the internal converter provides a number in the range 0 to 4095. The conversion time for each channel is 10 milliseconds and when the conversion is complete, the processor is interrupted and the value stored in a memory location for later access. These analogue inputs can be used not only in laboratory control situations, but also as inputs for games-paddles or joysticks. A 1 MHz buffered extension bus is provided for connection to PRESTEL, Teletext or various other expansion units. All interface sockets to external peripherals, are fitted to the Model B. These include R/G/B/Sync for colour monitors, Econet, serial interface, parallel printer, disk and tube. Having the interface sockets fitted enables the internal expansions mentioned above to be fitted without further soldering. Both Model A and Model B may have the following expansion options fitted internally at purchase, or by Dealers at a later date. - both of these enable Telesoftware to be downloaded into the BBC Computer as well as providing access to the normal Teletext/Prestel services. Pages may be "grabbed" and stored for later use. Considerable attention has been paid to the overall design of the system and application software. A modular approach has been adopted specifically to ease the interfacing of various high-level languages (such as BASIC and Pascal) to the operating system. Many of the operating system calls are vectored to enable the user to change them if required at a future date. The BASIC interpreter is an exremely fast implementation, very close to the Microsoft standard, but with numerous powerful extensions. Built-in 6502 mnemonic assembler enabling BASIC and assembler to be mixed, or pure assembly language programs to be produced. This package consists of two programs for the Model B. This suite of four programs for the BBC Computer Model A or B will perform a wide range of algebraic manipulations, and expressions can be symbolically differentiated or integrated. The package is intended for use in Mathematics teaching or research. POLYNOM can expand and simplify a polynomial expression into the equivalent polynomial. RATIONAL can expand and simplify an expression of rational terms into the equivalent ratio of two polynomial, reduced to lost terms. TRIGONOM can expand, simplify, differentiate or integrate a trigononetric expression, including ratios of trigonometric terms, into the equivalent standard form. FOURIER can perform trigononetric transformations into a linear combination of sines and cosines of integer multiples of x. The Peeko-Computer simulates the operation of a simplified microcomputer in order to teach the fundanentals of machine code programming; it is suitable for either the Model A or the Model B. The Peeko-Computer has ten easily learned instructions, and the display gives a visual analogy of the operation of a real microcomputer. Programs can be entered, single-stepped or run with the memory and register contents being displayed at every step. To aid comprehension each instruction nmemonic is displayed as it is encountered. The Peeko-Computer comes complete with a 16 page instruction annual including exercises and examples, and the cassette includes five demonstration Peeko-Computer programs. Acornsoft FORTH is a complete implementation of the FORTH language, to the 1979 standard specification, for the BBC Computer Model B. FORTH is a compiled language so programs run very fast (typically 5 times faster than BASIC). In addition to a comprehensive set of arithmetic and and stack operators, control transfer words and defining words, Acornsoft FORTH includes more advanced features for defining the actions of defining words themselves. This opens the door to "metaFORTH" and user defined FORTH-based languages. Acornsoft LISP for the BBC Computer Model A or B consists of 5.5k of machine code interpreter, plus 3k of initiallised LISP workspace containing utilities and constants, which can be deleted to make extra space if not required. It is intended for students researchers and hobbyists who want to find out about the fundamantal language of artificial intelligence research, and system designers who require more flexibility in data and control structures than is provided by traditional programming languages. The system contains a number of extensions to basic LISP, including PEEK, POKE, CALL and VDU to provide easy interface with the BBC Computer MOS (machine operating system), improved interactive control structures using LOOP, WHILE and UNTIl funtions and disk input/output control functions. This package is supplied in ROMs to fit inside the BBC Computer. It therefore uses none of the user RAM leaving about 27k bytes free for text - about 4000 words. It uses text mode 3 during text entry, with the top line continuously displaying the exact number of words in the document, and the number of bytes left free. When printing out, if there is more than 16K bytes of free RAM, then the screen can show the exact format of the printed output without actually printing it. There are an impressive array of formatting commands, which appear in a different colour (darker shade in monochrome) to avoid confusion, including justification, lines per page, line spacing, centring, etc., and the usual set of text manipulation commands. An advanced Adventure in which you tell the computer what you want to do, and it describes in plain English your progress through a fascinating world full of fiendish puzzles to be solved. To complete your quest you have to think hard about everything you do! No compromises have been made in this amazing fast action graphics game. Save the humanoids from the landers, using the ship s laser missiles, smart bombs and hyperspace jump. Complete with mutants, bombers, pods, swarmers and baiters to attack you. You control an animated figure pursued by monsters who chase him up ladders and along walls; the only hope of survival is to dig holes in the walls and trap the monsters by filling them in. Score more by dropping the monsters through several levels, but watch your oxygen. With sound effects and high score. A superbly authentic version of the currently most popular arcade game. Guide the Snapper through the maze eating dots and avoiding the creatures that chase you. Complete with full sound effects, score, and a ladder of high scores. 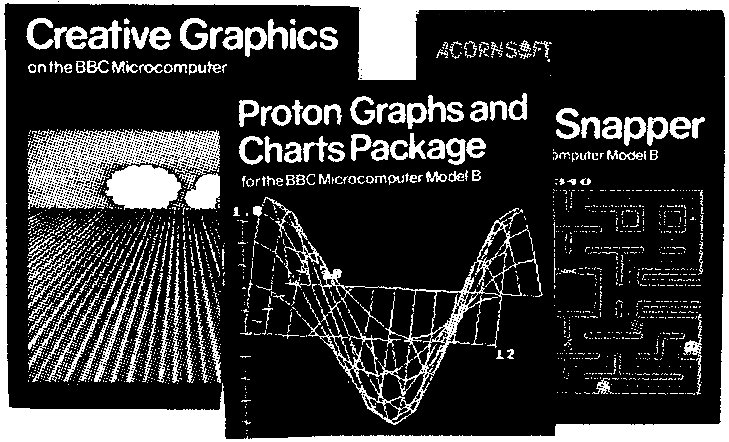 This book describes how to exploit the excellent graphics facilities provided by the BBC Computer. It includes 40 programs which will run on either the model A or the model B to produce a spectacular range of pictures and patterns in full colour, including animated pictures, recusively defined curves, and rotating three dimensional shapes. The book describes a set of graphics routines which can be incorporated into programs to present data graphically in a wide range of applications. The graphs include automatic scaling, labelling of axes and use of colours. Routines are included to draw two and three dimensional graphs, stereo pairs, two and three dimensional contour maps, bar charts and pie charts.